Come and join us at the beautiful Meadow Creek Mountain Resort again this Spring for our Introduction to Cob Workshop! We will be continuing construction on a 400 square foot cob house that we began at last year’s workshop. You can read about last year’s workshop here. 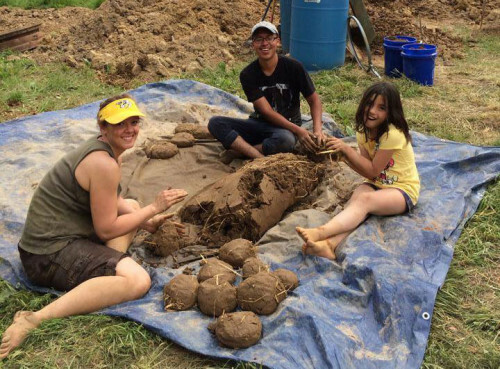 The workshop will be lead by Alex Sumerall, an east coast Natural Builder who has a focus on creating earthen structures that are healthy, aesthetically pleasing, and functional for modern life. He is the owner of This Cob House LLC, which is dedicated to teaching people about cob and natural building techniques. Alex has a background in business and advertising, and has been practicing Natural Building since 2011. He graduated from the Aprovecho School of Natural Building in 2013 in Cottage Grove, Oregon, and continues to teach, present, consult, and construct. Click to read participant testimonials from Alex’s workshops. Breakfast, lunch, and dinner will be served for each day of the workshop and are included in the price of the workshop. We will also have a celebration lunch when the work is over (May 9th). All meals are home cooked and delicious! We had some amazing food last year! You will feel energized and satiated for our long days. We are taking great care and expense to always feed you well.